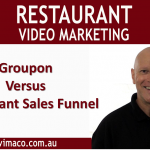 Why does your restaurant need a sales funnel? A sales funnel is an automated system that targets you ideal customers, drives them to your restaurant and converts them into raving fans that come back again and again. * You decide you need to spend money on marketing. * You look for a quick fix like Groupon. * You’re busy serving customers. * You have no time for marketing. That’s not a way to run a profitable business. You need a system that creates repeatable business and allows you freedom from money and time. The Restaurant Sales Funnel is a strategy that gives you control where to can turn it up or down like a tap. You can download your free Restaurant Sales Funnel Recipe pdf using the link below and start creating certainty for your business.